In 1986, a quartet from London scored their one and only hit with a clever cover version of a song associated with Elvis Presley, Can't Help Falling in Love. Presley's version sold a million and was a US top 3 hit in January 1962 and reached Number One in the UK. 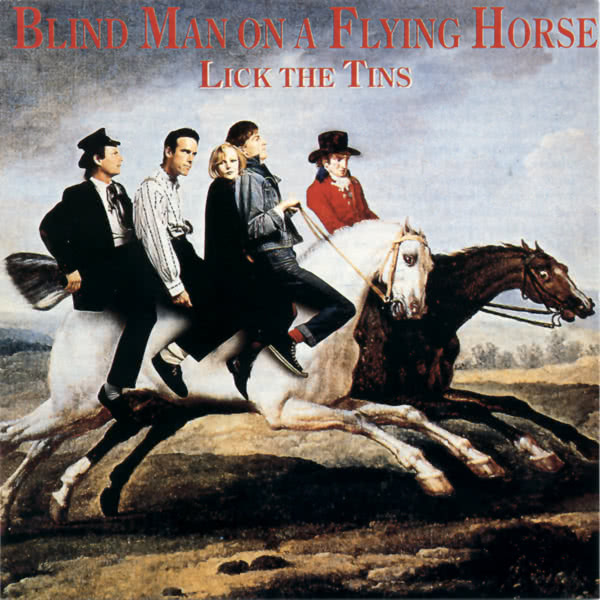 24 years later, the exceptional cover version by Lick the Tins didn't do quite as well as that, although it spent two months in the UK singles chart, but then Lick the Tins were almost unknown before the single was released, and returned to anonymity not long afterwards. This is their story, and this album features (almost) their entire output. Drummer Simon Ryan was living in Kilburn, North West London, when he re-met singer / songwriter / guitarist Ronan Heenan, with whom he had played in an earlier group, The Almost Brothers. This very obscure combo released a 1980 single, You'll Never Make It, which remarkably made the all-important Radio One play list, but the group folded soon afterwards. Ryan also got to know a friend of Heenan's, Alison Marr—both she and Heenan came from Northern Ireland, where he had trained as a veterinary surgeon, and she as a reporter before they moved to London. Ryan was a graphic designer, who worked in the art department of Stiff Records. Alison Marr also played penny whistle, and was a devotee of traditional Irish folk music, while Ronan Heenan was more influenced by rock and blues. They were intent on combining the two traditions, an example of which was their version of Can't Help Falling in Love—when Simon Ryan heard Alison singing a Celtic version of the song, with Ronan on guitar and with Alison's penny whistle, he was intrigued and suggested they record it, as it sounded quite interesting. The trio made a demo of this song in a rehearsal studio, and Simon Ryan played it to colleagues at Stiff who told him that he should not consider giving up his day job, and should get on with designing sleeves. Destiny struck when Bob Barnes, one of the precious few Gentlemen in the record industry, happened to be visiting Simon, who played him the demo. Barnes was a partner in a small independent record label, Sedition Records, who heard hit potential in the demo, and put the trio into Alaska Studios to re-record the song with producer Pat Collier (who had also produced the record by The Almost Brothers), and it was released as a single with a Ronan Heenan original, Bad Dreams, on the B-side. 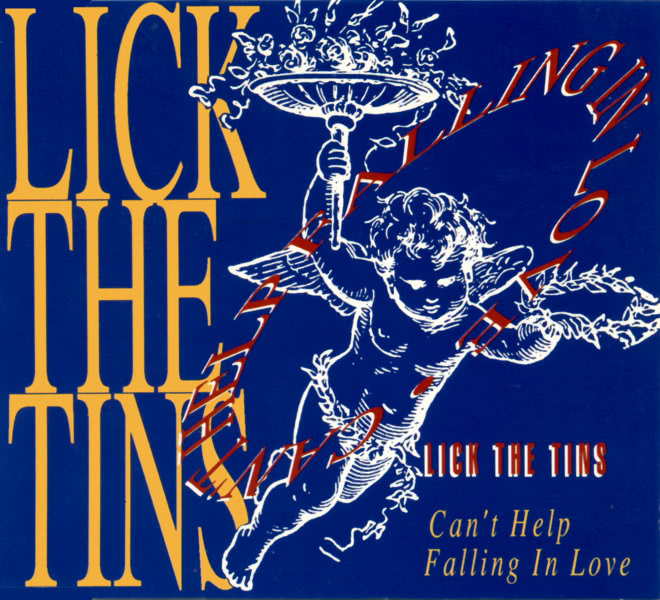 Where the Presley version of Can't Help Falling in Love was long and relaxed, Lick the Tins' version was so manic and fast that it was considerably less than three minutes long. As a result, three polkas were added to the end of the track to bring it to the desired length. London's Capital Records told Sedition that it was OK, but could be improved if it was made less ethnic, the result being that the single was edited to omit the traditional jigs. 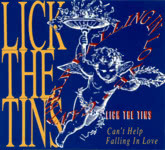 It was a hit, and before long, Lick the Tins (the name is derived from a nickname given to an old tramp by the children from Heenan's home town) began to perform on the London pub circuit, with the addition of Aiden McCroary, another friend from Northern Ireland, initially playing bass—he later moved to keyboards, and was replaced on bass by Chris Haynes. Two violin players also appeared separately with the group on their album and also alternatively accompanied the group on live gigs: firstly, Johnny “J.T.” Taylor (now a member of The Reggae Philharmonic Orchestra) and later Barry Wickens (ex-Steve Harley). Before the album was released, a second single was taken from it, Belle of Belfast City, much to Ronan Heenan's dismay, according to Simon Ryan: “He was mortified—he said it was like recording Ba Ba Black Sheep.” However, years later Van Morrison & The Chieftains recorded the same song and released it as a single. The Lick the Tins version's B-side was Calliope House, a song by the Boys of the Lough, but this was unsuccessful commercially. A third single, In the Middle of the Night, another Heenan-composed track from the album, with another Ronan Heenan original, Looks Like You, on the B-side and an additional track from the album, Road to California, added on the 12" version, similarly failed to return Lick the Tins to the singles charts, and their album, Blind Man on a Flying Horse, was not a major seller, although it received excellent reviews, especially in Folk Roots, where it was chosen as Album of the Month. A fourth single, an album track titled Ghost Story, was remixed by Pascall Gabriel, but this remains unreleased. Later, a version of Can't Help Falling in Love was remixed by Stephen Hague and included in the soundtrack of a “brat pack” movie, “Some Kind of Wonderful” (and appears on the soundtrack album) although copyright reasons prevent its inclusion here. However, everything else released by Lick the Tins can be heard on this anthology. Today, Simon Ryan again works as a freelance sleeve designer—the front of this album's sleeve is his work. Aidan McCroary has returned to the legal profession, although he is still recording music on his home studio. Alison Marr has just given birth to twin sons. Simon Ryan thinks it's sad that Ronan and Alison no longer play together: “Ronan's a very good songwriter and en exceptional musician, who was very serious—nothing he did was a throwaway—as was Alison. Their blend of rock & Irish was unique, like their version of Hendrix' Hey Joe”. Simon is now in a new band, as yet unnamed, while Ronan is rehearsing with his younger brother with a view to playing a more blues-oriented style of music. with grateful thanks to Simon Ryan, Alison Marr and Ronan Heenan.